15.00" x 10.00" x 0.60"-1.30" 6.00 lbs. Redefine your mobile gaming experience. 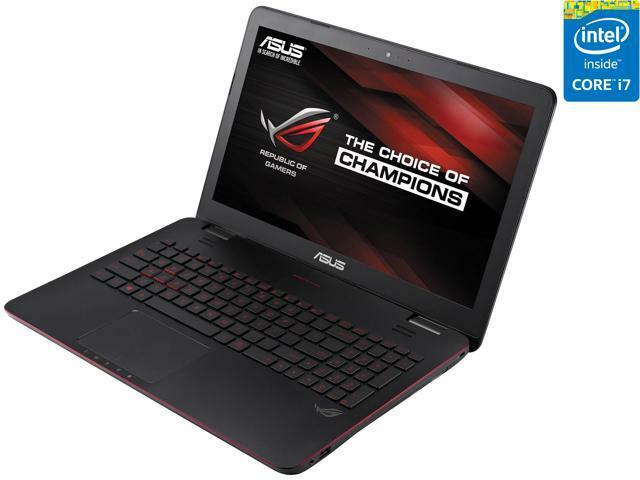 The ASUS ROG GL551 gaming notebook incorporates the state-of-the-art components like quad-core Intel Core i7 processor and GeForce GTX 960M dedicated graphics for you to game with smooth, lifelike 1080p visuals on its Full HD display. 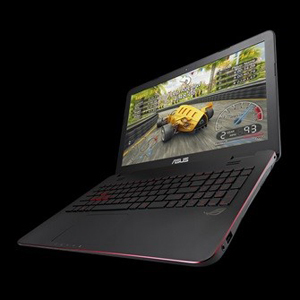 Advanced gaming technologies are built in to give you the gaming edge, wherever you are. 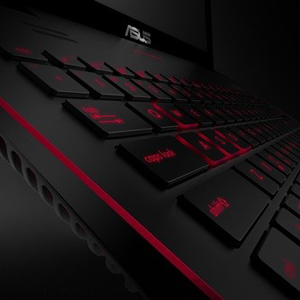 The majestic red backlit keyboard with adjustable brightness lets you game with no compromise even in darkness. The SonicMaster technology with large speakers put you into action, while AudioWizard enhances your audio experience with five preset modes. Its intelligent cooling design delivers maximum cooling efficiency and minimum noise thus you can game with optimized comfort. 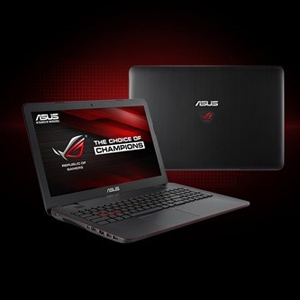 Plus, the cool brushed aluminum finish and arresting red design touches present the awareness of an ROG. 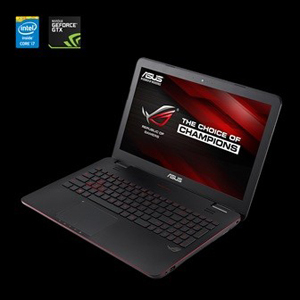 Dominate your competition with the ultimate gaming notebook. Like its stealth fighter-inspired beginnings, G Series laptops bring an understated design that does much more besides looking cool. The accented iconic red and black colors pay tribute to gaming’s dark-lit LAN party origins in a modern style that prepares you for gaming’s future. Be it a late night gaming session or LAN tournament, the backlit chiclet keyboard glows an aggressive red with user-adjusted brightness levels and specially-highlighted WASD keys for precise control and eye-catching visibility wherever you are. Get advanced desktop gaming performance everywhere with NVIDIA® GeForce GTX 960M dedicated graphics that lets you play your favorite PC games anywhere, at 1080p, with no compromise. With a single click, the NVIDIA GeForce Experience software optimizes games for the best performance and image quality possible. The result is a smooth frame rate with zero lag. Now you can play your favorite FPS or RPG as it was intended without even worrying about battery life – the Optimus Technology automatically switches between discrete and integrated graphics to deliver the performance you need, when you need it, while extending playing time. Armed with the latest 4th generation Intel Core i7 processor, the GL551 sets all-new benchmarks for powerful performance so you never have to slow down even on-the-go. Now you can play when you want, how you want. Heat is a gamer's worst enemy, as it can cause unreliability and performance degradation — but not with the ROG G series gaming laptops. With expertly-designed powerful thermal solution, the GL551’s exterior is tested and proven to be kept at a comfortable temperature level at all times for maximum stability — and maximum gaming pleasure. 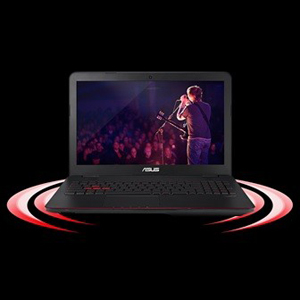 The GL551’s audio system packs a punch, featuring ASUS’ exclusive SonicMaster technology with large speakers and resonance chambers to deliver more powerful sound and deeper bass. This rock-solid audio foundation also comes with ROG AudioWizard, letting you personalize sound settings or choose between 5 preset modes for the ultimate winning soundtrack. 15.00" x 10.00" x 0.60"-1.30"
Pros: Well, it works well. able to play most of the game come out around that time. It is almost 3 years now, and I still use it to play OW,CSGO,GTA5, howevere it can't play PUBG. But i think it is a good choice. -Awful customer service at ASUS I sent this product in three times to fix a corrupted driver and they replaced the wrong thing three times. Other Thoughts: -I do not recomend this product. Huge waste of 1.3k$. Runs just as well as my 400$ Lenovo laptop from 2010. Thank you for taking the time to share your experience with us. I am sorry to hear that you are having an issue with your device. Try updating your bios to the latest version and running a clean installation of your graphics driver. Please allow me to be of assistance. Provide me with a detailed description of your issue so that we may collaborate for a solution. Feel free to contact me directly should you have any further questions or concerns. My email is cl-tom@asus.com and our 24/7 support line is posted below. Have a great day! Pros: It has 10-key and I like the OS. That's all I can say. Cons: This machine, which has only been very gently used, needed sent back to the manufacturer for repairs after only 7 months of light use. I never bothered putting anything new on it after that, because the manufacturers just replaced the hard drive (which wasn't the problem) and sent it back. The "fade to white" screen issue slowly came back and now I've owned the machine almost 16 months and it is totally unusable for the 2nd time. Other Thoughts: Would never recommend, I wish I could go back in time and buy ANYTHING ELSE. Thank you for taking the time to share your review. I am sorry to hear that you had issues with your laptop. What is the current status of your laptop? Please allow me to be of assistance. Provide me with a detailed description of your issue so that we may collaborate for a proper solution. My email is cl-tom@asus.com and our 24/7 support line is posted below. Have a great day! Pros: Looks great, look backlit keys, and runs decent. Cons: It has an overheating problem. The laptop gpu has a throttle temp. of around 75c and it throttles in just about every game I play. If I run at the lowest settings it's fine but I'm not a big fan of shooting at little moving smudges. This is a common problem and is very annoying to play with. Thank you for taking the time to share your review with us. I am sorry to hear that you are having issues with your temps. 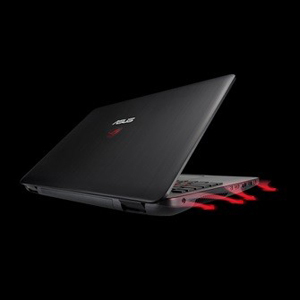 Those temperatures are very normal for laptops while gaming. If you like you can invest in a laptop cooling pad to keep them lower. Make sure to keep the vents clean with an air duster at least once a month to avoid dust build up. Feel free to contact me if there are any further issues. My email is cl-tom@asus.com and our 24/7 support line is posted below. Have a great day! Cons: the gtx 960m is pathetic for the price you pay, i would recommend paying that extra $300 or more just to get a proper gpu, it cant handle anything that is gpu intensive, just look up a comparison it ranks below the 10th percentile on userbenchmark. speakers are not very good, gets very hot, i bought a cooler master fan pad and i don't game with the laptop without the pad under it. Other Thoughts: its a pretty good machine but gaming is not a strong suit, i will not be using this as a gaming platform when my pc is finished, i dont think the $800 or so bucks is worth the price when you could go a couple hundred more and get a 1060 or 1070. And nowadays its just outdated so you would also have the benefit of getting a better cpu. Thank you for taking the time to write your review. I am sorry to hear that you were not completely satisfied with the value of your laptop. Please make sure to update your bios to the latest version and to keep your graphics driver update updated through the Nvidia experience utility. Update Windows to assure optimum performance. Feel free to contact me directly should you need further assistance. My email is cl-tom@asus.com and our 24/7 support line is posted below. Have a great day! Pros: NOTHING AT ALL. Terrible product and terrible service. Do not trust the manufacturer warranty or their service center or New Egg to help at all during first year if problems arise. Cons: This product was flawed from the get go when bought last December. We tried to live through the weekly and biweekly blue and black screens until they became daily. We bought the 2 year New egg warranty but found out that it only kicks in AFTER the first year of the ASUS warranty. Lots of time on phone with ASUS tech support having us download new drivers and much more. Problem continued and then got worse. Finally sent in on RMA to be repaired in August. Problem was with "bad Pool Call" error message with no code. ASUS on phone said it was display related and that they would replace our display. Instead, after shipping off computer to repair center (at our cost of $16.25 for packaging), repair center put in new power supply and did nothing to fix problem. After receiving unit back in August, it seemed to work for the first week and then started doing the same thing. We again tried to live with it but it has now become a daily ordeal of multiple reboots after multiple blue and black screens. Called ASUS back and demanded new computer. They refused. We have to send back at another cost of $16.45 now to have the same repair shop in California (we live in Washington) try to fix the problem they were supposed to have fixed the first time. ASUS Customer Service does not care (third party call center) and will not do anything other than force an expensive and time consuming RMA every time. New Egg was useless with our problems once they had our money. Would not help with our problems with ASUS. Thank you for taking the time to write your review. I am sorry to hear that you had a negative experience. We will take your review into account as we strive to improve our products and services in order to better suit your needs. Please let me know if you need any assistance. My email is cl-tom@asus.com and our 24/7 support line is posted below. Have a great day! Pros: Beautiful build, the red accents are gorgeous and accents the sleek black design. Good battery life when not gaming. Keyboard is very comfortable and the backlighting excellent. The screen itself is magnificent, the resolution spectacular and the color output very accurate and bright. Cons: The laptop itself is a major fingerprint magnet, especially on the lid. Other Thoughts: Overall, this laptop is amazing, and I would absolutely recommend it to anyone interested. As my first foray into PC gaming, it has proven to perform and run brilliantly. It doesn't have an SSD, that's about it. Other Thoughts: Another thing that is not so much of a con rather than something that annoys me. When you plug in headphones to the headphone jack, it does not connect automatically, you have to wait for a message to pop up so that you can approve it. This gets annoying when i plug in my headphones and the message doesn't pop up and I have to keep unplugging and plugging back in and then waiting like 30secs to a min for the message to come up. I don't know, that kinda just annoys me when I want to play or watch Netflix and it just doesn't work for a good minute or 2. Other than that this laptop really is great, one of my favorite purchases in a while. I went from not being able to play Metro Last Light, all low settings on 800x600 resolution, window mode on my other $500 laptop, which was able to handle games like LoL, CSGO and COD fine, to being able to play Metro at 1080p on high and ultra settings with solid frames. That's something that makes me smile.